Jacob has grown up on a feast of his grandfather’s stories. The most imaginative being about Grandpa Portman’s childhood. 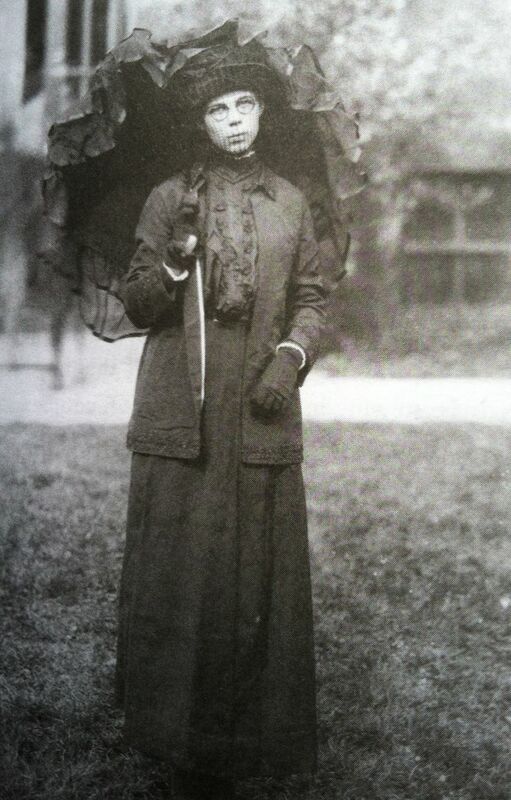 Portman was born in Poland and at twelve sent to a children’s home in Wales. Because, he said, the monsters were after him. The monsters in this instance were the Nazis. Abraham was the only survivor, the rest of his family were killed in the concentration camps. As Jacob gets older, he stops believing in his grandfather’s stories. More fantastic still were his stories about life in the Welsh children’s home. It was an enchanted place, he said, designed to keep kids safe from the monsters, on an island where the sun shined every day and nobody ever got sick or died. Everyone lived together in a big house that was protected by a wise old bird-or so the story went. A happy ever-after ending? As Jacob discovers this is only half the truth, the other half is the stuff made of his nightmares. After the horrific death of his grandfather, 16 year old Jacob has what appears to be Post Traumatic Shock Syndrome. He is duly sent to a psychiatrist who is more than just a little interested in Jacob’s dying grandfathers’ last words. His grandfather leaves him a copy of The Selected Works of Ralph Waldo Emerson. 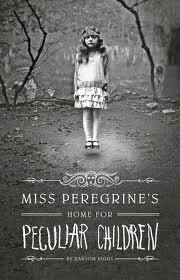 In it he discovers a letter from the headmistress of the Welsh children’s home, Miss Peregrine and the postmark Cairnholm Is., Cymru, UK. With the blessing of his psychiatrist, Jacob sets off with his father, to a remote island off the coast of Wales, Cairnholm. Here he discovers the shell of what was once Miss Peregrine’s Home for Peculiar Children. In amongst the ruins of the house he discovers an old trunk and proceeds to smash it open. In the midst of the debris and wreckage, he discovers a bundle of old photographs that seem familiar. They shared a certain nightmarish quality with my grandfather’s old photos, especially the ones he’d kept hidden in the bottom of his cigar box, as if somehow they’d all come from the same batch. After finding the photographs in the old house, Jacob leaves. He meets Emma, a strange girl who he follows through the woods and a bog, to a cairn that he walks through. He finds himself in a brighter place, the bog dry, and heads for a town that looks different. It’s not only the landscape that is different but time too. On checking a calendar he discovers it’s September 3. 1940. And then one of the last things my grandfather said came to me. On the other side of the old man’s grave. It was something I’d never been able to figure out…”The Old Man,” I realized was what the locals called the bog boy, and his grave was the cairn. And earlier today I had gone inside it and come out someplace else: September third, 1940. Jacob meets Miss Peregrine, who is really what’s known as an ymbryine, a shape shifter, she is in fact a bird, a peregrine, who can manipulate time. We can manipulate time fields consciously—and not only for ourselves, but for others—are known as Ymbrynes. We create temporal loops in which peculiar folk can live indefinitely…Only women are born ymbrynes, and thank heaven for that! Males lack the seriousness of temperament required of persons with such grave responsibilities. The loop is in fact only one day, 3rd Sep 1940, that repeats over and over. The day the children’s home is bombed. It is the ymbryine’s who are responsible for re-setting the loops each day. Catastrophe, cataclysm, and disaster will follow if this doesn’t happen. Miss Peregrine and her Peculiar Children give Jacob a performance, not dissimilar to acts you might see at a circus. The invisible man, a woman who turns into a bird, a girl who swallows fire, a gravitating routine and of course ‘THE AMAZING STRONG-GIRL OF SWANSEA’! People come to sideshows to see stunts and tricks and what-all, and as far as anybody knew that’s exactly what we showed them…[It] used to be the way most peculiars made a living. The peculiars don’t age (unless they leave the loop) so it seems odd that Jacob’s grandfather and Emma, who is still a teenager, were in love. Portman left the children’s home to fight the monsters in WWII, and never returned. Inevitably, Jacob and Emma fall in love. He discovers that his grandfather could see the monsters, they are invisible to most people even peculiars. And that when Portman disappeared on hunting trips, really he was hunting the monsters. Slowly Jacob realizes, he too is peculiar, he can see monsters. And what’s more they have followed him to the Island. Jacob has to make a decision that will change his life forever. Part fantasy, part adventure, part eccentric photo collection. I’d had this book on my #TBR pile for some time. Just the title grabbed my interest. Being a little peculiar myself, anything in fiction that could be about children in care gets my interest. I enjoyed the Before more than the After. I think this had to do with my suspension of disbelief. The first half felt very realistic, all that happened could truly have taken place in real life. The second half didn’t quite keep my attention, and I felt this part of the book would suit younger readers. This didn’t detract from my enjoyment, I was just more aware that I was reading a story. A feature film of the book, directed by Tim Burton is due to be released March 4, 2016. You can see a movie trailer here. 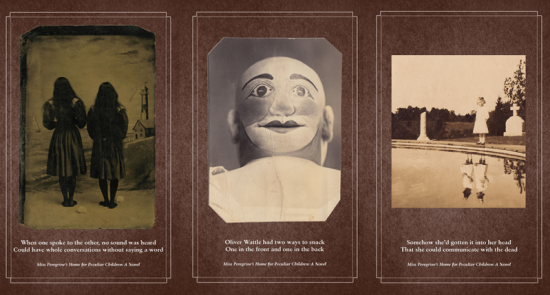 *The author Ransom Riggs, began collecting vintage snapshots and he found the strangest and most intriguing ones were always of children. This entry was posted in Blog, Orphan Lit, Reviews and tagged After, Before, children's home, peculiar, Ralph Waldo Emerson. Bookmark the permalink. When you said Jacob followed the girl Emma, I was very creeped out! What kind of grown man follows a girl around? But then you said they fall in love…does Jacob turn into a boy, or is Emma actually a young woman and you just called her a girl? Hi, I’ve added that Jacob was 16. Does that help? It is a bit confusing, physically the peculiars don’t age. So, Emma and Jacob are the same age though she had a relationship with Abraham Portman 50 years previous.